This is probably the healthiest and best leftover salad ever. I made it last week when I found myself drown in work, gasping for air and for something to eat. Like most of us, I of course had no time to eat, and even less time to cook or to go buy groceries. Luckily I found a jar of cooked quinoa I’ve been just moving from one place to another for 3 days in my fridge, trying to get to my overnight oats. Ding ding ding! Lunch is ready: quinoa salad! 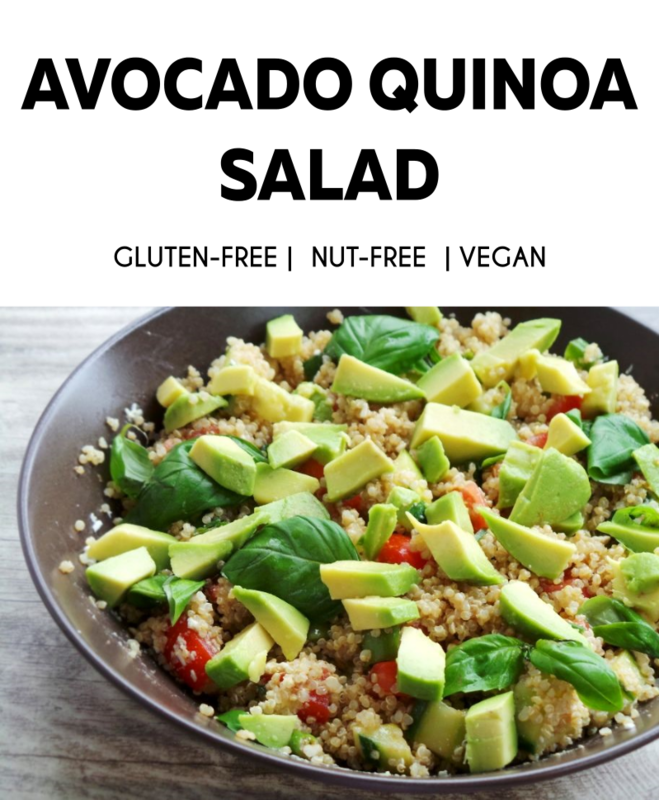 I did not have all the ingredients to make my quinoa detox salad, so I invented a new somewhat “leftover” detox salad that’s perfect for summer. I used very basic ingredients, whatever I had at home. And I must say, this quinoa salad tastes amazing. You will feel satisfied, yet light and will be able to do some more work after lunch. Personally it made me feel a little like Superwoman, because I did not need to take a nap on my desk this time. Finally!!! Who knew this is possible? And who knew that such a simple salad can taste like heaven? I also had some feta cheese leftovers in my fridge, so I crumbled them and threw them into the salad. If you are vegan or live dairy-free, just don’t add it. You can add olives, peppers, maybe even artichokes…I imagine it would be quite awesome. You actually don’t really need to make this salad out of leftovers, you can also use new stuff. But if you have leftovers, this is your best chance to also do something for your health and your beauty. 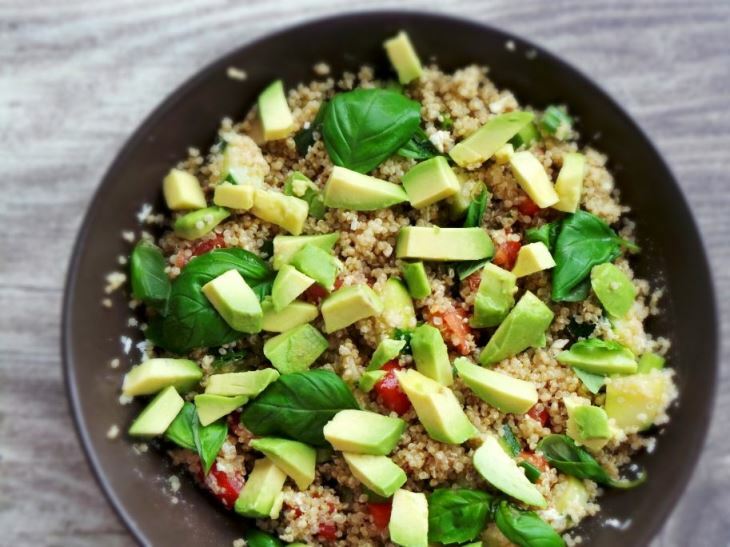 This quinoa salad is high-protein thanks to that crunchy fluffy Latina called quinoa and it’s also a great way to boost your vegetable intake. The vegetables are paired in a perfect way, because the healthy fats from the avocado help you absorb the phytochemicals from the other vegetables better. These phytochemicals are important for the prevention of numerous diseases. In fact it’s shown that most of the health benefits we experience when we eat more fruits and vegetables are because of these phytochemicals. So making them more available should be the goal of all our lives. Or, you know – not. But if it’s easy to do, why not? A little extra health benefit here and there did not harm anyone. Speaking of health benefits, this salad is also high-fiber (just noticed it sounds like high-fiver), detoxifying, suitable if you need to lose weight and it helps maintain normal blood pressure. And this salad is of course as all recipes at Beauty Bites great for your skin. The skin needs protein and vitamin C just to build collagen; fatty acids to stay moisturized and prevent dryness; the antioxidants lycopene from tomato and vitamin E from avocado to stay protected from free radicals. This salad offers the whole beauty package. 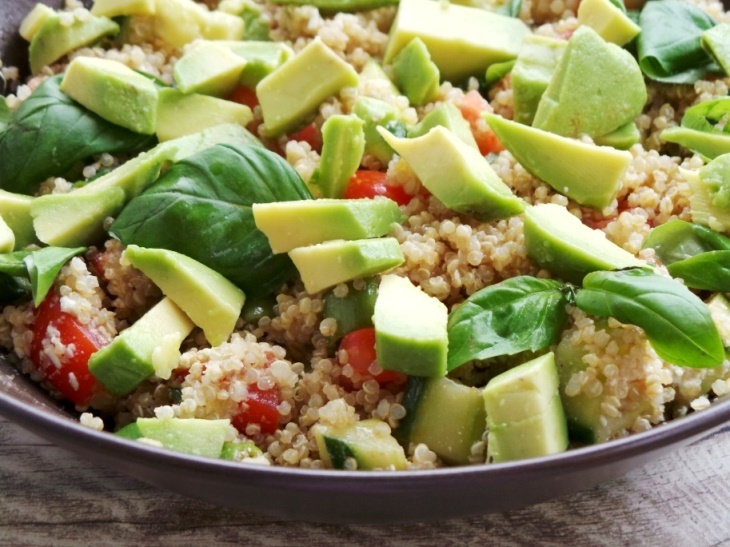 Put cooked quinoa, avocado, cucumber, onions, basil and tomato in a large salad bowl. Add lemon juice, vinegar and olive oil and mix everything well. Salt to taste. Optional: add some feta cheese on top. I really hope you decide to use your leftovers the smart way and make gold (or this salad) out of them. As I mentioned, you can also buy the ingredients especially for this salad, because it is totally worth it.